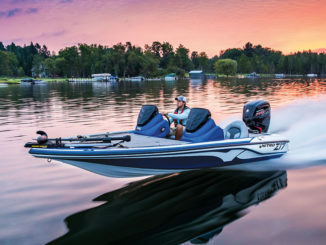 With 35 feet of length, this a fishing is no longer part of the big units of its category. However, this is enough space to offer comfort, good marine behavior and real livability. 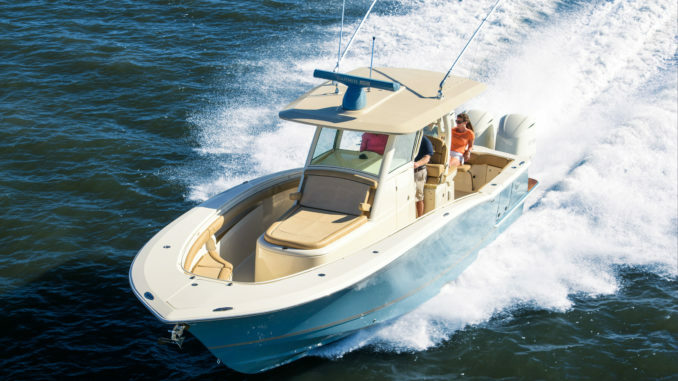 Built in South Carolina, the Scout 350 LXF comes from the manufacturer’s top of the range, the LXF. This series includes seven models from 25 to 42 feet. The 350 comes in between the 320 LXF and the brand new 380 LXF unveiled at the 2017 Miami Boat Show. Aesthetically, the 350 almost resumes the characteristics of its brother’s range, including a recognizable meander line. The prow has a high bow with a good angle of attack and a cleverly flared form to keep the crew protected from spray while creating more space on board. The rear also keeps a good width and guarantees stability. The stern ends with a large platform on which the engines are hooked by a bracket. A good-sized hardtop overlooks the cockpit and offers good protection. 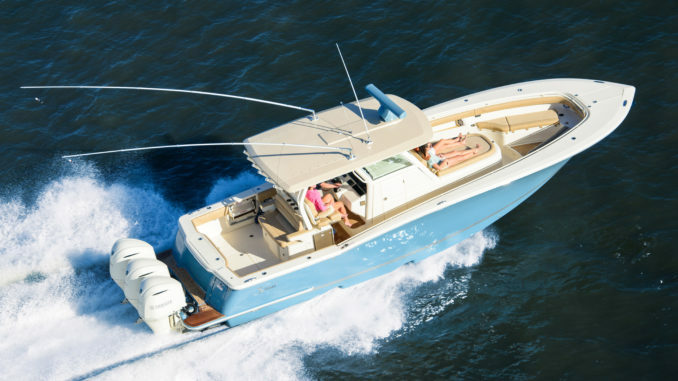 Like the other boats of this category, the Scout 350 LXF offers a luxurious interpretation of the fishing boat. There is a beautiful u-shaped seat on the front that can be completed by a table or a solarium, but it’s a shame it doesn’t have an extension. The front part also does not have a cushion. On the other hand, one is found on the entire periphery of the boat. It is very nice. 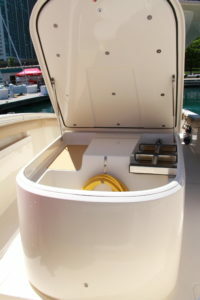 Hidden under the front seats, the storage options are numerous and the boat is even equipped with an anchor to station. 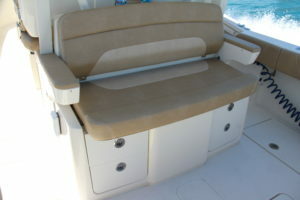 The front of the console extends widely to offer lounge seats with armrests and, just below, a very large place to store big equipment. 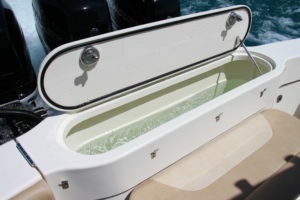 The rear of the boat is more traditional with a nice freeboard, a fish tank and two beautiful folding benches, one hanging on the transom and the other on the back of the big block behind the pilots. Good point also for the two fish tanks in the floor and for the central box in the floor. 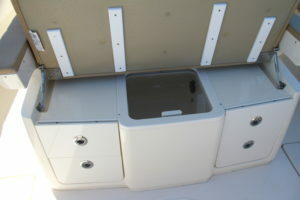 The transom also incorporates a live well with a small tray on the top. 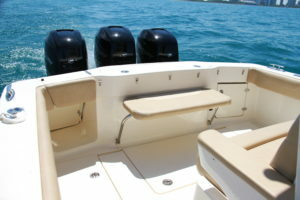 On the port side, the side door ensures easy access to the sea and is convenient if you catch a big fish. Driver and copilot take their places on two individual seats separated by a glove box and storage. On their back, beside the folding seat, there are storage compartments, drawers and a second live well. You can also opt for another block including an outdoor kitchen with a grill. 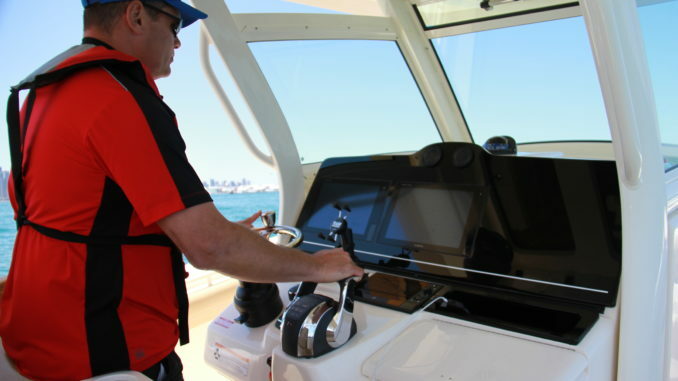 Rather impressive, as on all the fishing boats, the console offers excellent ergonomics. The solid windshield is very effective and the dashboard can receive three large electronic screens, all connectors, the joystick and even a small storage box. The footrests even have handrails. Inside the console, the designers have taken advantage of the volume since a side door gives access to a real habitable space. This cabin, beside a good height, has a washstand, an integrated cooler, a toilet, a microwave and even a convertible double bed. The place also benefits from good lighting and some additional storage. 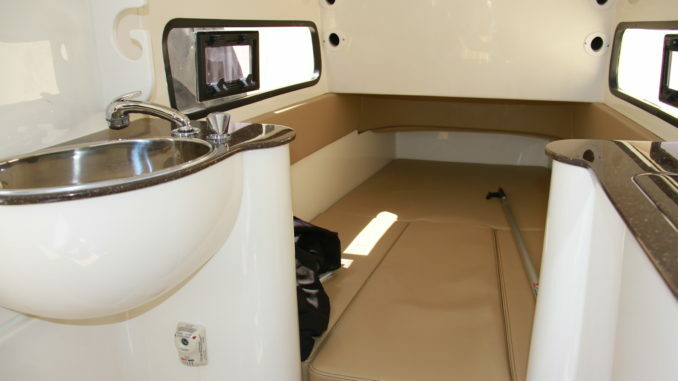 The equipment is obviously related to the rest of the boat, including an audio system, the courtesy lights, a cooler, a microwave, the electronics and the list is still long. Once on the water, the Scout is not really shy. Besides its 10.60 m length and its very conquering bow, the boat takes advantage of a hull with lively bilge and two generous steps which are not only there to make it pretty. Its weight is still correct and it has a good distribution of the masses. This means that means the Scout does not get put in the rear excessively at the start and maintains a good attitude, whatever the circumstances. 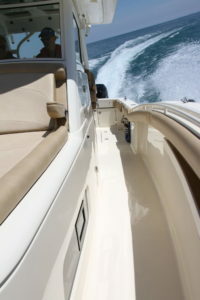 Good point for the lateral balance which gives the boat a very safe behavior. Using its steps, the 350 LXF is pretty fast since it planes in 8.5 seconds (in fresh water) and reaches 20 knots in less than a second later. Once in its lines, the Scout has a masterful behavior, literally erasing the waves and providing a good level of comfort. Finally, the 320 LXF is able to go far and fast. 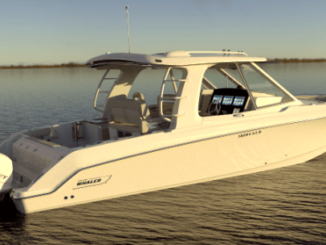 With 3 x 350 hp Verado, the maximum engine, the cruising pace is around 40 knots and when you push the handle, you are close to 60 knots and it begins to get interesting. But this is not the most important thing. Indeed, what makes this boat convincing is that it is able to sail very fast in bad weather. 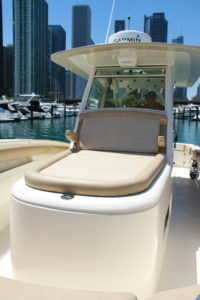 It will allow you to go back to the marina even if the elements are unleashed. Of course, no need for this power. With 2 x 350, you should already have fun, in any case. 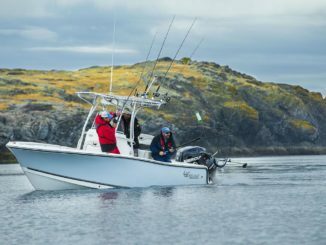 Mimicking the concept of the 320, but with more space, the 350 LXF offers an excellent level of comfort whether in navigation or in anchorage. It is also well furnished, well equipped and very well made. Last advantage, its price is still competitive enough to be tempting.